artists from all around the world! I enjoy studying old art books written long ago. After years of research, I felt that I must share all this valuable information with you because it really is the legacy left to us by past artists. Essential instructions have been gathered together and condensed into one easily accessible version - saving you hours of trawling through numerous books! This book has everything you need to learn the basics of drawing and sketching ...and it's here now! Well, guess what? ...It is now quite possible for you to be one of those clever people who can jot down an instant visually! is accessible at any age! You don't need any special knowledge to take up this hobby, you can start straight away and all the while you will experience the wonders of creation as you watch yourself grow and improve. Find out for yourself that you can successfully create images following the techniques in this how to sketch guide. There is no risk, I really do have your best interests at heart, if you're not 100% convinced you can create a sketch within 60 days, I want you to get your money back. No questions asked. No hassle. 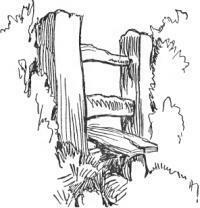 Sketching is such an interesting pastime, there are many of us who love and admire sketchwork. Looking at sketches is like being privy to the artist's thoughts and feelings and that's something that has always kept me fascinated. ''This is a great eBook! 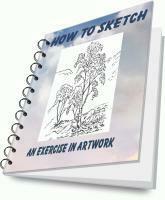 It's designed for the beginner, but has some good information and exercises even for the experienced artist. It takes you from looking at your subject properly to conveying that onto paper. A must-have for anyone who wants to learn how to sketch, and also for those who want to improve their drawing skills. Plus, all the hard work has been done for you, I've collected years and years of fantastic tips and tricks and they're altogether in this one guide! Once you are shown the basics, it's a life-changing moment when you see you can create a great sketch with just a few strokes! 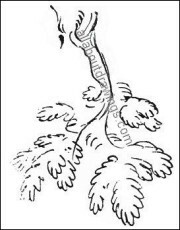 Illustrations in the eBook show you how to achieve this look - see the example (on right) of how to sketch a branch - it's like trickery with a pencil. Visualize yourself depicting a simple reflection of a scene -- it's peaceful, it's just you and Mother Nature -- and you realize you've left behind all stress and worry. Sketching naturally takes care of your mental health and that's a huge benefit. Fortunately, after much digging, I found good, clear directions on how to sketch and now it gives me great satisfaction when I see that I can produce what I visualize. I share all of this information with you, there are no secrets in this house! All you need is a pencil and paper. You can sketch any place, anytime. Meet new friends at sketching clubs. You can sell your artwork if you choose. Just think, once you know how to sketch, you can replace your camera with a sketchbook -- every sketch will transport you back to that time and place just as effectively or better than a photo can. I wasted 40 years thinking that I didn't have the natural gift that was required to draw. I don't want you to experience the sadness I feel when I realize my life could have been so much richer having sketching as a hobby. Each one of us has the ability to draw. All it takes is a little instruction or guidance and your excitement starts the same moment you realize I'm telling you the truth! This book makes learning how to sketch so quick and easy, you'll be amazed at how soon you will be producing great sketches. You don't need to be experienced or talented, once you know how to sketch, your drawing skills will also evolve and come alive! The book is lightweight reading and you might discover that sketching is just the thing for you. It's true, we all learn best by seeing and doing. That's exactly what you are encouraged to do in this eBook, ''How To Sketch''. Learn by example with a little explanation and you will learn a lot. Yes, we learn how to sketch by sketching -- more rapidly than by any other means combined. There's certainly great value in things that last forever and this eBook is one such item. It contains information that will never go out of date. It's actually better for you to read it over and over again, you'll pick up hints you missed first time around. Sometimes things make more sense as you practice, grow and learn. Imagine yourself getting compliments about your sketches - you become more energized and that impetus really helps your sketching skills to develop faster! Libby (school teacher), Queensland, Australia. Please note that you are not purchasing a physical book. This is in eBook format only. It's called an eBook because it is an electronic book. The biggest advantage of an eBook is the instant delivery. There is no packaging and shipping to pay for, no waiting time. Doesn't add to clutter, it sits nice and tidy inside your computer! A 'no questions asked' money back guarantee. Immediately after your purchase, you can download and start learning new tips and artists secrets within minutes! The How to Sketch guide (plus all bonus books) is delivered in PDF format, viewable on any computer (PC or Mac) and printable on any printer. This is a downloadable product because that is the fastest way for you to start using the information. It also means the book is cheaper because you don't have to pay for printing and shipping. The payment process is managed by ClickBank, the world's number one provider of downloadable products since 1997. Clickbank process payments via VISA, MasterCard and PayPal and your transaction is encrypted via ClickBank's secure server. The 100% refund policy is backed and administered by Clickbank.com, the internet's largest seller of digital products. Read the whole book, try the techniques and if you find it's not for you, simply email Clickbank.com and they will refund you in full. Of course, you can use any medium, but this guide's focus is on pencil so you're not procrastinating over which medium to use before you start. The secret to proportion - a technique that you'll use for life. Also, for your convenience, there's a Glossary included at the end of the Sketching Book which gives the meanings of common art-related words. If you haven't got a spare sketchbook, you can always quickly make one of your own from things just lying around the house. In this book you'll find a really easy step by step process to follow. More than 60 good-sized drawings and sketches of varied topics from past artists - these are great practice for you to copy and learn from as you go along. A step by step drawing book that's great for young and old alike. A definite favorite of mine that I had to share with you. Even though it's actually a 'How To Draw' book, every bit of practice helps you to get those ideas down on paper quickly! That's right, when you purchase the ''How To Sketch'' eBook, you also receive FOUR bonus products as a token of my thanks. That's way less than one hour with an art teacher yet it lasts you a lifetime! 97 page ''How To Sketch'' guide which is many books rolled into one. Bonus report - How to make a sketchbook. Bonus report - Drawing and Sketching Tips. 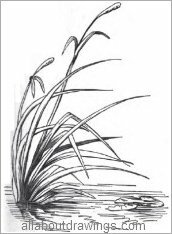 Bonus book - 60+ Illustrations to Copy and Study. Bonus book - How to Draw Step by Step (73 pages). Your investment equates to less than $3.00 per item! Don't forget, it's guaranteed you'll like it or your money back. The ''How To Sketch'' eBook provides you with the foundation to become a sketch artist. All you need besides this book is a desire to learn how to sketch. You can learn how to sketch with confidence! I wish you many delightful and rewarding moments with your favorite sketching pencil - don't you deserve that? P.S... Do something special for yourself, buy this book right now! P.P.S... Please Don't Wait Too Long - Make Sketching A Priority in your life Now. You'll LOVE it! ''Just from reading your book it amazes me how I never actually SAW sketches before, or the world in terms of light and shade. I now look at trees in the forest in a whole new light, so thank you for that. Invest in How To Sketch plus bonuses for only $14.90!